I’m not nearly finished with Orting, but I felt the need to take a break and decided to do it with Bucoda. When I first found the name I pondered over whether it was pronounced, Byou-ko-da, or Boo-ko-da. then someone sent me a note saying it was Buh-ko-da. Recently I found this at the Bucoda website, “During the Regular Town Council Meeting on September 10th The Town Council Adopted a Proclamation for the name BOO-CODA for the month of October. Wherever possible, within and promotional item, BOO-CODA shall be the Town Name in order to create a branded identification for Bucoda, Washington.” So ends the cogitation on this subject. Located between Centralia and Tenino on Hwy 507, along the Skookumchuck River in Thurston County, WA, it was named using the first two letters of the names of three of the founders of the city, James. M. Buckley, Samuel Coulter and John D. David. Not the most imaginative method, but it worked. Aaron Webster Arrived in 1854 and was the first settler at the site. He established a small saw mill, Apparently also had a farm which he sold to Oliver Shead. The original name of the town was Seatco, and I’ve found two explanations of how it came to have that name. First, that the Indians gave it the Chinook name which meant, “ghost,” or “devil,” when they saw Mr. Webster’s saw mill eating up the trees. According to Indian legend, Seatco is the evil one; demon of the dark forest. In the form of a large Indian, he robs traps, breaks canoes, steals food and goods and when bodies are found dead without explanation, their deaths are attributed to him. In short, he is responsible for all unexplained bad things. I think this explains how they felt about Mr. Webster’s saw mill. The second. according to Neal Corcoran, one time mayor of the town, is that Oliver Shead chose that name and that it was probably a reflection of Shead’s personality. More on Mr. Shead and why the name might apply later. Probably the most documented piece of history relating to this little town is that it was the home of the first Washington Territorial prison. Seatco prison deserves a whole post, or maybe two, all to itself. For the moment I will merely say that it was called, ” Hell on earth,” and Mr. Shead figured prominently in its reputation. I visited Bucoda in 2009 on a whim. 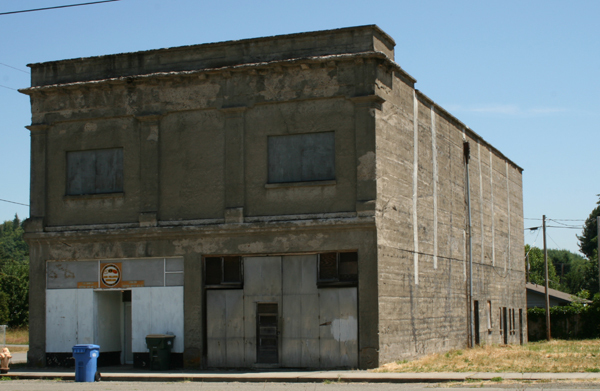 The main building, and the one that caught my eye, was what turned out to be the Odd Fellows Hall; unique in that it is a two-story, poured concrete building. Recently I read that there has been some renovation done to this building, one more thing to check out. Officially incorporated as Bucoda on June 7th, 1910, this little town has a rich history in the coal, timber and railroad industries and as I further research and photograph it I will post more information about this. 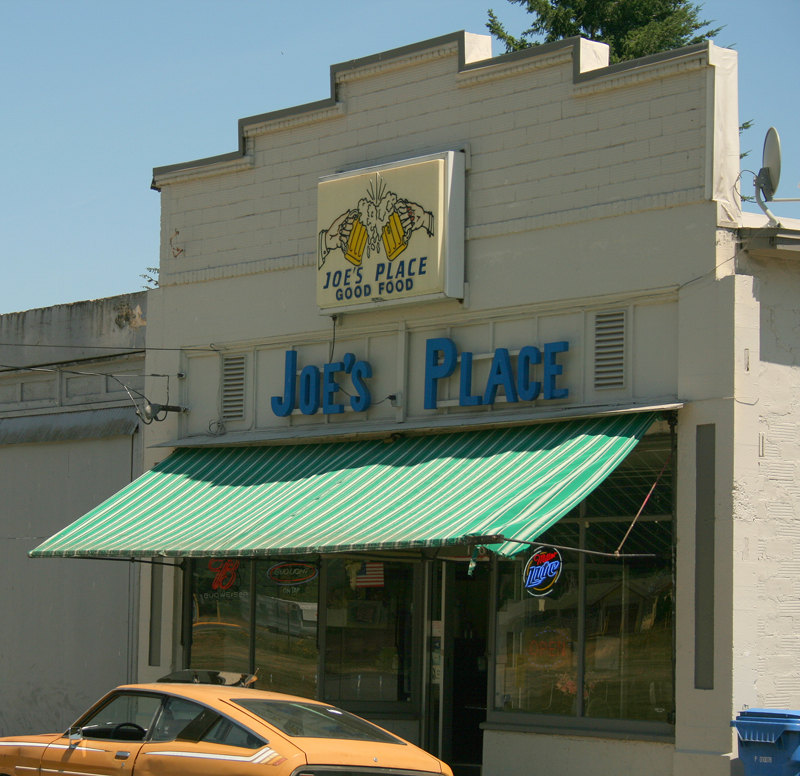 The other prominent structure on Main street is Joe’s Place, which advertises good food. Joe’s, it is said, has been in operation since the aforementioned heyday. I didn’t get the chance to try the food, but I will be making the trip back soon. As I noted in my first post, not every photo will be on subject, and this one is a favorite of mine that I took a few miles up the road on this trip. More on Bucoda at some future date. Meanwhile, if you’d like to see more of my photography, visit my photostream at Flickr. 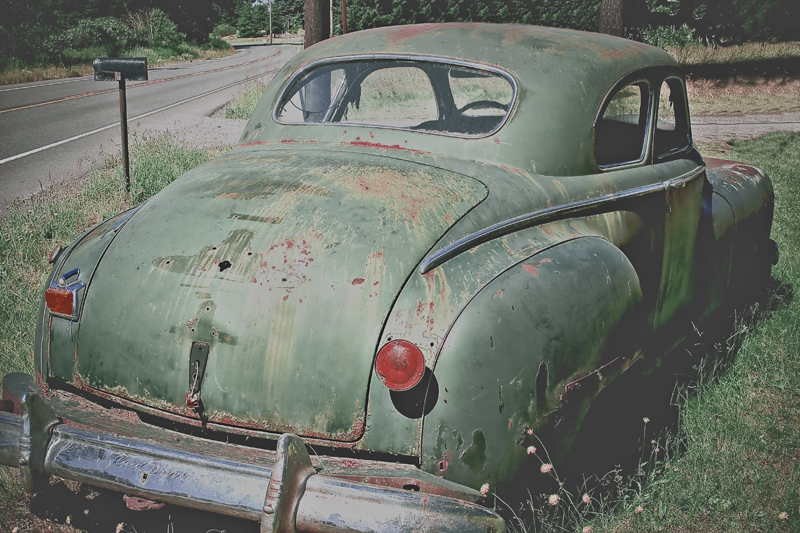 This entry was posted in Bucoda, Seatco and tagged 1948, Aaron Webster, Bucoda, Club Coupe, Dodge, James M. Buckley, Joe's Place, John D. David, Neal Corcoran, Odd Fellows, Oliver Shead, prison, Samuel Coulter, Seatco, Skookumchuck River, Thurston County, Thurston County Washington, Washington by opticalreflex. Bookmark the permalink. I have a friend who lives in Bucoda. Visited him a few times, and it seemed an okay town! 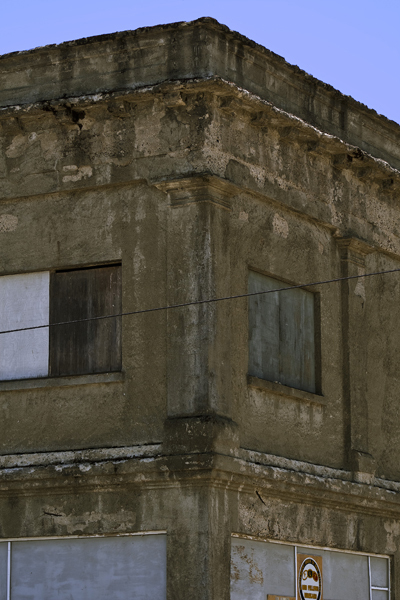 The people who live there like the small-town feel, and being close to the big city. They’ve gone through some rough times, especially with this economy. I was there today and things seem to have improved since I was there in 2009, hope it’s a trend. Love this information, thank you. I live in Olympia so will check it out. Thanks for dropping by. As I’m sure you noticed, I’ve been a little lax with posts for awhile, but Olympia is certainly a possibility.